1884 print showing Grandma and children. 1884 print showing Grandma and children. This is from the Frank Leslie July 1884 magazine feature print showing a elderly woman sewing and 2 girls putting a feather in her cap, the title of the print. This print has been professionally framed in acid free materials and has a standard glass front. mint condition, excellent craftmanship in the litho print. 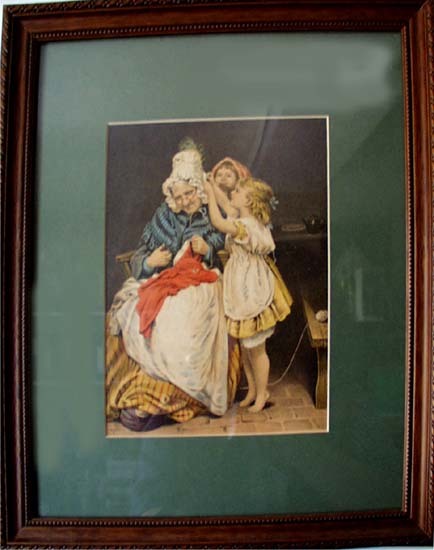 12 1/2 x 15 1/2""
Items Similar To "1884 print showing Grandma and children." Currier & Ives Foil Framed Print.